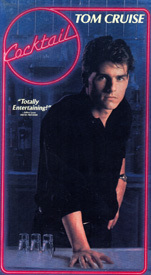 Tom Cruise (Top Gun, Risky Business) as bartender Brian Flanagan, is strained, shaken and slightly on the rocks. More barfly than bartender, Brian Flanagan’s hit the hottest watering holes, from Jamica to Manhattan island. He is a master at working a crewd with this wit and rakigh charm, while playing Saturday-night singles. And whether he’s lusting after preety Lit. majors or Soho nouveaux riches, Brian’s as quick with a hustle as he is mixing a kamikaze. So why is it that this hop, cynical charmer of the midnight meccas can’t get a handle on his own hear? For Brian it’s a sobering question.